Heathers has arrived. Today, Paramount announced the upcoming TV show will premiere in March. Based on the 1988 film, the dark comedy will be set in the present day and follow Veronica Sawyer (Grace Victoria Cox), a girl dealing with her own group of vicious Heathers. The cast also includes Brendan Scannell, James Scully, Melanie Field, Jasmine Mathews, and original movie star Shannen Doherty. Heathers debuts on Paramount Network on March 7th at 10 p.m. ET/PT. 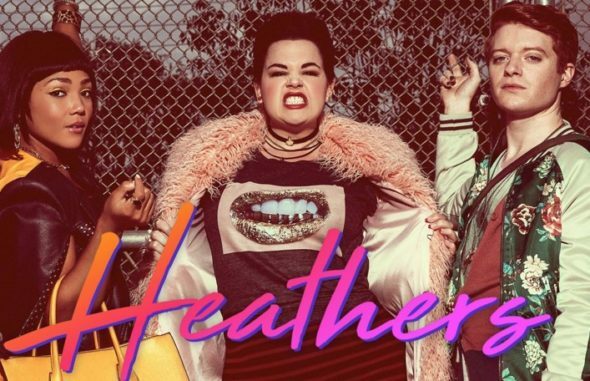 Heathers,” a pitch-black comedy anthology series based on the 80s cult classic film of the same name, will premiere on Paramount Network on Wednesday, March 7 at 10 pm, ET/PT. Set in the present day, “good girl” Veronica Sawyer (Grace Victoria Cox) deals with a very different but equally vicious group of ‘Heathers.’ Heather Chandler (Melanie Field) is the unconventional leader of this popular high school clique and rules Westerburg High through fear, intimidation and amazing fashion sense. Heather Duke (Brendan Scannell) is Heather C’s #1 sidekick and harnesses the Heather’s power to destroy whoever he views as a total discount hobgoblin. Heather McNamara (Jasmine Mathews) is considered the nicest Heather in the group who lives in the shadow of the others. She’s hiding a dark secret that she doesn’t want to be exposed. JD Dean (James Scully) is the new boy in town with a dark side and sets out on a reckless path of destruction proving that no one, even his girlfriend Veronica is safe. Original Heathers cast member Shannen Doherty guest stars as a pivotal character in several episodes along with Selma Blair and Casey Wilson. What do you think? Are you a fan of the movie Heathers? Will you watch the TV show? More about: Heathers, Heathers: canceled or renewed?, Paramount Network TV shows: canceled or renewed?